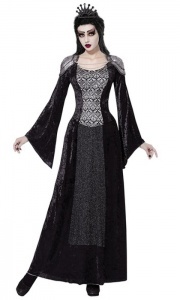 Includes: Ladies Evil Stepmother Costume, Black and Silver Long Velour Dress with Headpiece. Great Stag, Festival, Gay Pride or Carnival Costume. Includes: Yellow and Blue Dress and Red Bow Headband. Great World Book Day Costume. Includes: Dress with Latex Chest and Apron. 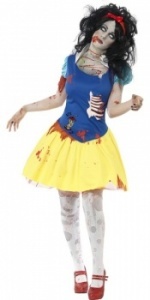 Includes: Ladies Princess Snow Costume, Blue and Yellow Dress and Red Bow Headband. Great World Book Day Costume. 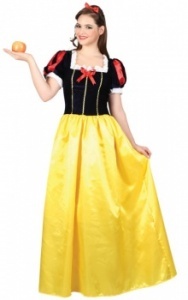 Includes: Ladies Curves Snow Princess Costume, Blue and Yellow Dress and Headband. 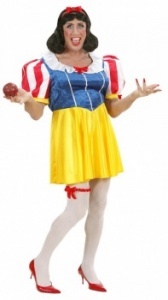 Live out the magical movie by dressing up in one of our Snow White Costumes. She is the youngest snow princess; the "Fairest of Them All". 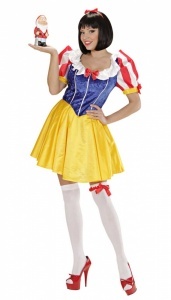 Whatever size you are looking for we will have one to fit, as we stock many sizes from XS to XXXL in many of our fancy dress costumes. Why not complete the look by adding a wig and tights. 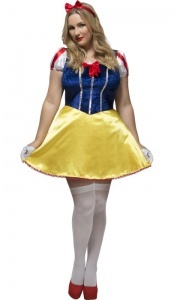 For the larger lady why not take a look at our Snow Princess Curves Costume as this offers plus size and is a very generous fit. We have long and short dresses for all occasions.